I enjoy sending holiday cards. It's my little way of reaching out, to the extended family on the other side of the globe, to friends made during travels and work and school, and to local friends too. I often write a holiday letter if inspiration hits, and I enjoy receiving such letters myself. The French don't follow this tradition so I know my cards last year surprised many of our French friends. They seem much more likely to connect over new year's wishes, which are frequently sent via mobile texts or Facebook posts these days. Holiday card sending and receiving may even be a little passé in the U.S., what with the ubiquity of social media, but frankly, in a year when I'm not writing a holiday letter (too little time and inspiration), sending cards still lets me connect with others, AND it is a very good way to take stock of the year and of one's social connections. 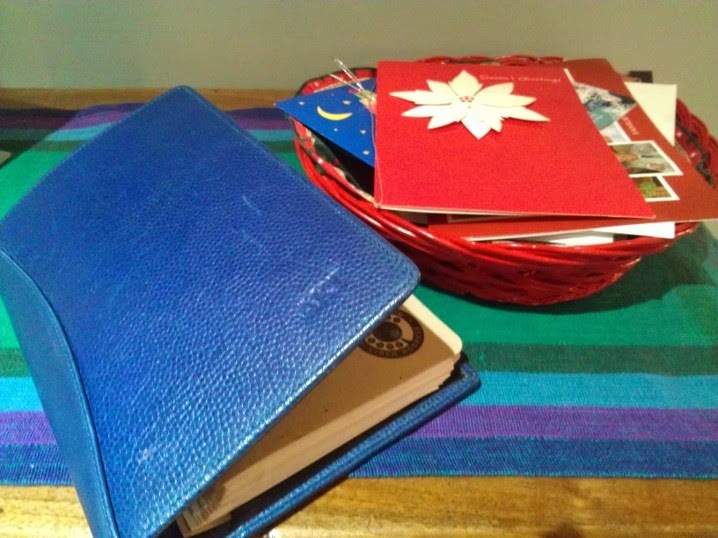 As it turns out, my address book and my card list both have needed some adjusting this holiday season, in ways that I haven't experienced before (and that I'm not sure I like). Up to now, my address book has been something that has generally gotten thicker; it grew quite a bit over the past few years during my French sojourn. (I use a physical address book to which I add little cards that represent each entry and that slip into a special binder: Levenger's mini-Circa model which may not even be available anymore. I use digital address books for email and phone number lists only.) Over the years, I've had to order additional cards to keep up with births, marriages, new friends, new addresses, but this year there seems to be a notable tightening going on. In at least two alphabetical sections, I have had to cross out, condense, or rewrite a number of entries due to many more relationship breakdowns, divorces, and deaths than usual. Perhaps it's just coincidence this year, but as a sociologist, I have to suspect that what I see may be a more significant, age-related shift in my social networks. Is it all downhill from here? Maybe, but maybe not. As I consolidate my address book, my social networks on social media continue their intricate spread, even in the face of divorce or death. This month I've had my first significant experiences with the ways that social media are used to memorialize people and announce deaths. I recently lost a childhood friend who was an avid Facebooker and while I got the news of her sudden passing via the now old-fashioned phone, it is through our more contemporary forms of social media, and the tributes posted via those media, that I have learned more about this friend's remarkable adult life. And on my Facebook news feed the other day, I caught the announcement of a memorial service for another friend's deceased family member. While I haven't felt comfortable posting a personal message of sympathy on the boards for all to see, I've been astonished by the depth of feeling and the eloquence expressed by others. I have also wondered if these posts and tributes are comforting to the immediate family, or is the 'public' sharing overwhelming? I suppose we all in some way like to know that we have made a difference, or that our loved ones have, and perhaps these social media announcements and tributes offer sufficient testimonials to that. Obituaries in more traditional media like newspapers also continue to be important testimonials. In the U.S., at least in my local paper, the obituary section has grown while I was in Europe and now frequently includes photos and detailed stories of the dearly departed. On the other hand, I have always found even the simple death notices in the national newspaper in Finland to be quite moving for the small glimpses they reveal, of the 'personal ', in what is generally a fairly discreet and private society. These are fairly large rectangular notices without the detail of U.S. obituaries, but there is often a poignant verse in addition to the name of the deceased, the birth/death dates, and the immediate survivors' names. Such subtlety may be lost on the Facebook generation (and anyway, it's only the family that posts such an announcement in the paper), but I think such notices still matter. Posting Facebook tributes, reading obituaries, updating address books, sending (or not sending) holiday cards are all social rituals that mark, in small ways and big, the waxing and waning of our social networks and the inevitability of the human cycle of life.